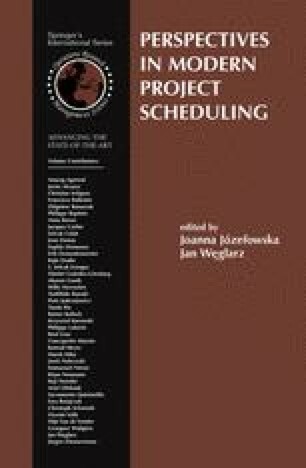 In this chapter project scheduling problems with setup times are considered. Some practical applications justifying considering setups separately from activities are described. An extensive classification of setup times adapted from machine scheduling is proposed, including activity vs. class setup, separable vs. inseparable setup, as well as sequence-independent and sequence-dependent setup times. A new category of setup times - schedule-dependent ones - is discussed. The main part of the paper shows how to model setup times in the presence of particular project components, such as: precedence constraints, resource availability constraints, multiple resource units requests, multiple resources, etc. Some possible extensions of the presented models are given.